At the risk of being repetitive, I’m going to bang on about the weather again. Because it’s now very, very hot. Today it was 45 degrees celsius when I took the photo above, and reportedly it reached 46 in Delhi at some point. Slightly trumping the previous hottest temperature I had ever experienced, which was 44 in Athens (Greece) and Brindisi (Italy) when back-packing around Europe in the late 80’s. My memory of Athens was that elderly people were dropping dead in the street—according to the media—and that I was taking two cold showers a day. 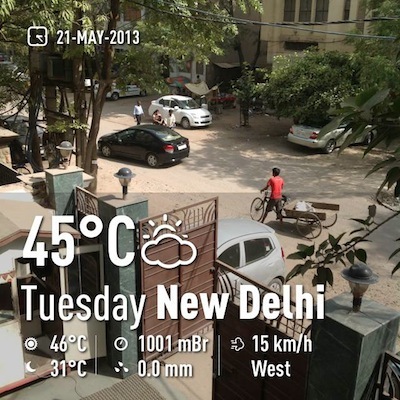 A temperature of over 40 degrees in Europe is a freak heat-wave, but in Delhi it’s fairly normal for this time of year. And it will possibly get hotter still between now and the monsoon arriving. The mercury has been rising steadily since I arrived here 4 months ago, but what I’ve found interesting is the qualitative change as it reaches the big four-oh. Once it’s over 40, one of the first things I noticed is that you can feel the hot air in your nostrils. Not warm, hot. As it climbs even higher, you can feel your eyelids and even your eyeballs responding to the searing heat—which is also extremely dry just now. Humidity was 8% today! On the other hand, I think I’m getting used to it. An important factor is how you respond to it. Avoiding walking around outside (!) really helps—so I’ve been getting cycle-rickshaws to and from the metro station, rather than my usual walk. Paying someone Rs 20 (24p) to haul my carcass for 5 minutes rather than walking for 15 and arriving soaked in sweat is a good deal in anyone’s book. Work days are relatively easy because I spend all day inside an air-conditioned office, except when I have to walk to another building for meetings. Weekends are more challenging because you can’t really do much, except for heading for a nicely air-conditioned café to while away the hours. Or sleep. I’m doing a lot of sleeping on Saturday and Sunday afternoons these days. The plants on my newly-acquired roof terrace aren’t bearing up quite so well. 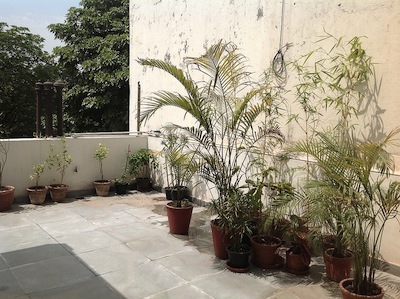 They’re desperately in need of some shade, and I bought shade netting but haven’t yet managed to locate some local bamboo-walas so I can actually suspend it in the air with something. I’ve been watering twice a day, and moved everything close together so that the more robust plants will provide some shade for everything else, but even so a few plants have shrivelled, presumably due to the actual heat rather than from being in the sun. My new apartment is great. I moved up to the second floor (from the first) around 3 weeks ago. Unlike the 2-bed place downstairs, this one has only 1 bedroom and feels much better for what I need. It’s also the same overall area as the flat below, but with the benefit of the roof terrace. The main downside is the kitchen, which is tiny, and you have to go outside to reach it. It gets absolutely hammered by the sun during the day, and being so small it gets very very hot in there. During the first week I took a box of eggs out of the cupboard to cook breakfast, and discovered that all the yolks had burst. Mind you, most of the rest of the flat gets really hot during the day too—the downside of being on the top floor. Finding that your toothpaste or shampoo is warm when you use it takes some getting used to. On the plus side, I haven’t used the water heater in weeks, because the water coming out of the shower is never cold. The tap outside, which I use for filling the watering can, even supplies hot water in this weather. Yesterday my doorbell caught fire. Electrical wiring here is never that dependable, but it’s quite likely that more than 3 weeks of it being 40+ every day had done weird things to the metal parts, since it was mounted outside on the wall out on the roof terrace. Maybe something got bent inside and caused a spark, but basically it went up in flames when someone rang it repeatedly yesterday afternoon. 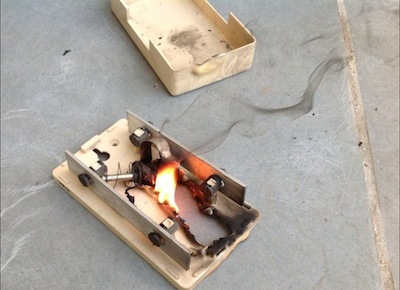 Fortunately I’d taken the day off work, and noticed the smell of burning coming through the a.c. so I went outside and caught it in ﬂagrante delicto. It’s school holidays now, and around Defence Colony where I live it has suddenly become much quieter, especially in the mornings. The metro is also not quite so packed. I’m looking forward to getting away somewhere myself soon too—apart from the odd day here and there, I’ve not had any holiday since I started this job in January. With the stifling heat here, I’m currently thinking of somewhere cool and lush in the Himalayas… perhaps Darjeeling, or somewhere in ‪Uttarakhand‬. Or maybe finally going to Kathmandu. Any suggestions?